Yesterday I took a large number of pictures of an event designed to help bring relief to the people of the Gulf coast who's lives have been so greatly affected by the Oil Disaster. Yes, I call it a disaster! Untold quantities of oil have been released in the waters of the Gulf of Mexico. That oil has to go somewhere! It is currently going to the shore of Louisiana, Mississippi, Alabama and Florida. It is almost certain to affect a much greater area in the near future. We will be dealing with the effects of this disaster for many years to come I am sure. I group of people, musicians and others, have started a project to privately raise funds for Disaster Relief. 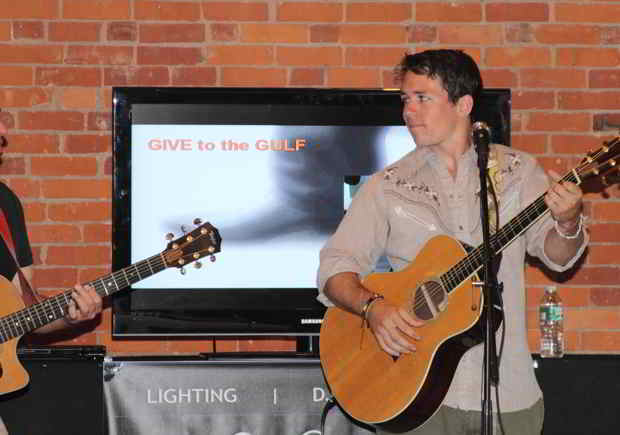 This project called "Give to the Gulf" had a press release event yesterday and that is the event I photographed. I will put up some of the photos on a separate page. Look for the tab at the top of the page. I will tempt you with one here. This young singer named Jackson has contributed his talents and music to help in the Relief effort. For the web site of Give to the Gulf go to http://www.givetothegulf.org. You can find some of Jackson's music there to download from itunes. The small price you will pay will all go to relief efforts in Louisiana and the area with the help of the United Way of Louisiana. Musicians can contribute their talents by adding their music to the music to be downloaded and there is a link on the site for that. I am in New England which is far from the Gulf but I hope to do my little bit to help those effected by the great and terrible oil release in the Gulf. Visit the site and download a tune or two. For a news report follow this link to NBC 30 News. Another News Channel, WTNH in New Haven put up a video report.